Hooray! This is the inaugural post documenting our experiences with eBooks. Little J and I sat on the couch, fired up the Samsung Galaxy Tab 10.1 and went to our library’s website. Scholastic’s BookFlix portal, when accessed from the link from our library’s website, has got to be the most boring way to begin an eBook adventure EVER. I assume this is a general log in page for a number of services that Scholastic offers. We dutifully typed in our library card number and waited with bated breath, sans banana. “We read Boo Hoo Bird?” said Little J hopefully, holding up his paper copy of Jeremy Tankard’s awesome book. Two years olds love waiting for websites to load almost as much as they love waiting for Laurie Berkner to buffer on YouTube. 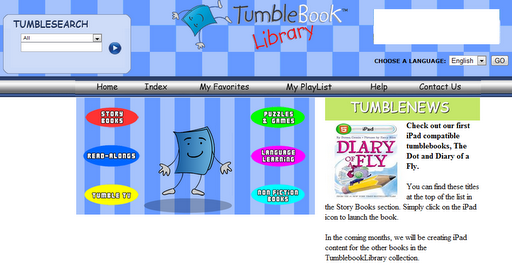 We gave up on Bookflix and moved on to Tumblebooks. The Tumblebooks “library” is organized into six sections: storybooks, read alongs, tumble tv, puzzles & games, language learning and non-fiction books. We were on the prowl for a good yarn, so we clicked “storybooks” and chose a book from the first page: Bonnie Farmer and Chum McLeod’s ABC Letters in the Library. Tumblepad, the software that Tumblebooks uses to display its content, didn’t require installation- it just popped up when we chose our eBook (we will try downloading an eBook for use without an internet connection in future posts). I liked the dashboard well enough, but the display area didn’t shrink to fit onto our screen. I had to scroll around every now and then to see the text. That seems like a pretty basic requirement: fitting onto the screen. I tried a number of other eBooks and had the same problem. I tried holding the tablet portrait and landscape. No dice. We got through ABC Letters in the Library, mostly because it was our very FIRST Little eLit eBook and I was trying to be magnanimous about it all. ABC Letters in the Library contains forced rhymes and outdated views on what a public library is all about. See an extended review this book here. One redeeming feature was the “zed” at the end of the alphabet. My Canadianism squeed at that, even if the rest of the book was a flop. 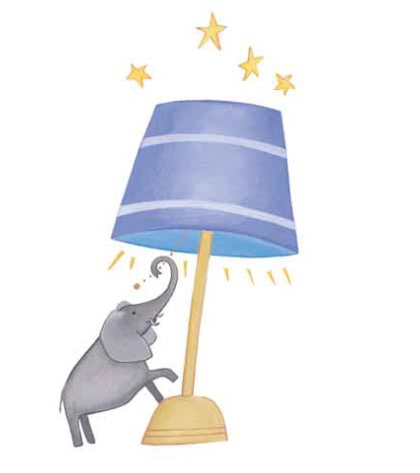 Little J reminds me that the elephant at the end of the book was also a redeeming feature. Whatever cooks your noodle, kid. Posted on November 29, 2011, in Android, BookFlix, eBook, Review, TumbleBooks. Bookmark the permalink. 2 Comments. I love the story telling aspect of your review. Hopefully other sites are easier to navigate. Now I want a tab. sigh too many tech toys make my mind go mush. Thank you! I hope to keep it interesting! I have a whole list of devices I want, too! I think a tablet is the best for kids. I'd love to have an iPad, too, to compare the experience. If only money grew on the Chicka Chicka Boom Boom tree.